Tornadoes are the most sensational of meteorological phenomena given the attention they are given. They can cause enormous destruction and loss of life, thus it is no wonder they get so much attention. Many of the same atmospheric conditions that lead to strong convective wind gusts and hail can also lead to tornadoes. A tornado can be one of the products produced by a convective thunderstorm. The vast majority of convective storms do not produce a tornado but there are special storms that do and even more special storms that produce significant tornadoes. The significant tornadoes are the largest, most destructive and most dangerous of the tornadoes. This writing focuses on the many factors that typically need to be in place for a significant tornado event to occur. 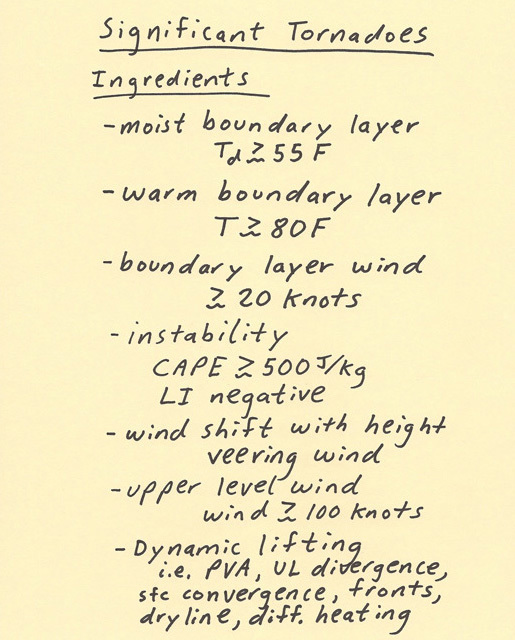 These ingredients are general guidelines and do not guarantee tornado activity since the atmospheric conditions can change rapidly or other factors may be in place (such as a cap) that prevents convective storms. The threshold values on diagram are general guidelines and not a hard fast rule of thumb. Below are the general conditions that are generally in place during a significant tornado event and after the list is an explanation of why each is important.